On the way back from Pangkor Island on 12 December 2013, we stopped at Teluk Intan. Teluk Intan formerly known as Telok Anson，it is a town located in the state of Perak. 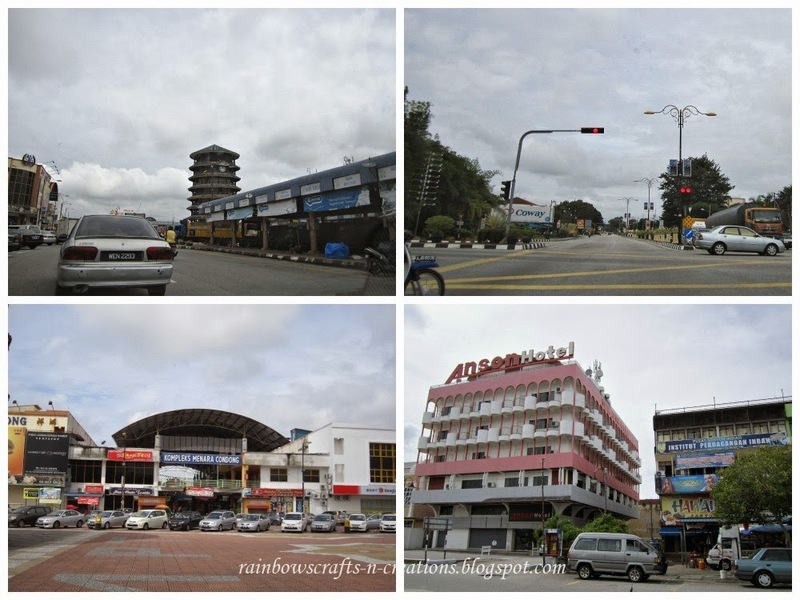 It is the largest town in Hilir Perak district. 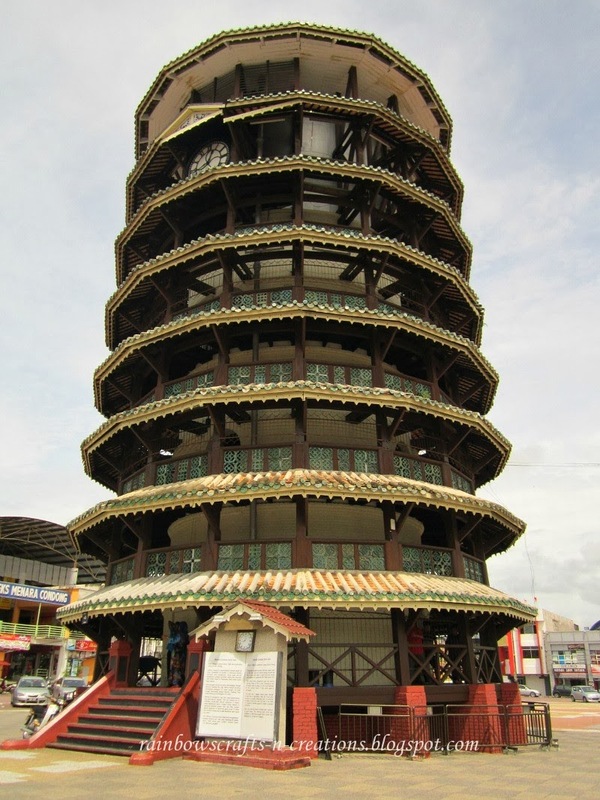 The leaning tower which located at the town center is a famous landmark of Teluk Intan. According to the information board in front of the tower, it stated that Teluk Intan Leaning Tower built in 1885 by contractor Leong Choon Chong. Originally housed the water tank that supply water to the town area and reserve during drought and fire. It was also used to report time and served as beacon to guide ship into Telok Anson Port. The tower drew comparison with the famous Leaning Tower of Pisa in Italy. Standing at only 25 meters with 110 steps, it is not as tall compared to Leaning Tower of Pisa which stand at 55 meters. The tower have a 'pagoda' shape design. Although it look like an eight-storey tower, the circular brick structure is actually three-storey high. The structure is made of wood and brick. The base of the tower is 13 meters in diameter against 8.2 meters in diameter at the top. Now, the Leaning Tower of Teluk Intan serve as a clock tower. The chiming clock which was installed in 1894 was bought from London and designed by J.W. Benson-Ludgathy. Once we entered the entrance, we saw a Malay guy sitting at a counter on our left hand side. Initially, we thought we have to pay for tickets. Finally, the guy told us that it is free admission. One of us only needed to register name and address in the record book. We had a chat with the guy and we knew his name，Hisham Sahak. He is a staff of Teluk Intan Municipal Council who takes care of the Leaning Tower of Teluk Intan. He showed us a piece of paper which reported the interview between Hisham Sahak and a reporter from a local press. I read it and took a photo. From the paper, we know the history about the tower, factors of tilting and the mechanism of the clock. One thing that I was so interested in it is that the mechanism of this chiming clock is not self-winding, there is a need for manual winding once a week in order to maintain the normal function of the clock. Therefor, the clock tower's caretaker Hisham Sahak would wind up the clock's mechanism every Wednesday. Another information that I got from the paper is that this leaning tower slants to the northwest. Many theories abound about it tilting. Some locals said it started to tilt four years after completion due to an underground stream. Anyway, according to Hisham Sahak one of the factors that caused the tilting of the tower was the weight of the water tank. 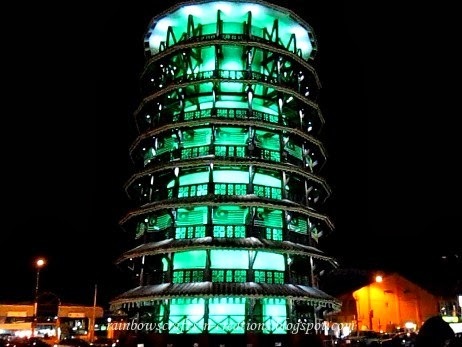 The Leaning Tower of Teluk Intan is decorated with blue, orange, purple and green lights that gradually change colour at intervals. It looks majestic at night. Thus, the locals and visitors are flocking to the town square at dusk. In the ground floor, there is what appears to be a well facing the main entrance and some old photographs adorn the walls. There is a narrow spiral staircase leading to the second floor. The second floor is empty, only a few photographs hang at the walls. Another spiral staircase leads up to third floor. Here you can see the base of the old unused water tank above you. Walking by the encircling platform you would have a 360 degree view of Teluk Intan. Here you can see the Komplex Menara Condong (Leaning Tower Complex), Medan Selera Menara Condong (Leaning Tower Food Court), old styled shops as well as a town square which at the back of the leaning tower. View of ground floor, the spiral staircase and the base of the old unused water tank at the top of third floor. View from the Leaning Tower of Teluk Intan. Later, we drove around the town for about an hour. There are many hotels near by Teluk Intan Leaning Tower. The Grand Court Hotel and the Anson Hotel are impressive hotels. View of Teluk Intan town. After we drove around the town, we found a place to have some local food, the name of the stall is called Hawaii. It is just next to the Anson Hotel. We ordered the famous ‘Ice Wan Tao Long’. It is a kind of shaved ice with some special ingredient which looks like 'jelly' on top of it. The taste of the jelly itself is tasteless and no artificial colours but the shaved ice is sweet and sour. Other than that, we also ordered Ice Kacang, Rojak, Mee Kicap and Laksa with fish ball. Teluk Intan is not only known for the tower that looks very much like the Leaning Tower of Pisa in Italy but also the excellent traditional cuisines and snacks sold here. Many of the popular foods sold here have a long history with special recipes pass down from generation to generation. There are a lot of food courts, restaurants and street stalls around the town. To me this is a great destination for food lovers. A day trip to Kuala Selangor.